The season has now wound down at Rotopounamu. The 1150 bait stations were cleared and the 50 traps were shut down at the end of March.Tracking tunnel results continued to astonish us with rat and mice indices sitting below 5% for the months of November, December and January. One of the objectives in the Rotopounamu Management Plan is to maintain rat numbers below a 5% footprint tracking index during the spring and summer period to allow native birds to successfully reproduce. 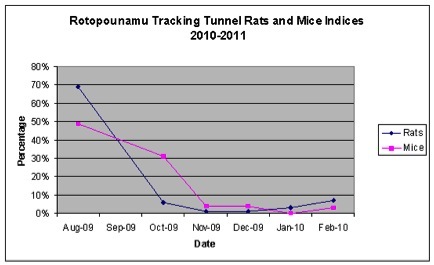 Rodent numbers haven’t been recorded this low at Rotopounamu since 2007. Throughout the month of February, Project Tongariro intern students and DOC staff carried out the annual bird monitoring at Rotopounamu. This is the main form of outcome monitoring we undertake at this site. 500 bird counts have been completed however the results are yet to be analysed.